Zoopla.co.uk have today launched their iPhone app, which you could say is better late than never. The benefit of being out later than the other main portals property apps is that they have some additional features worth looking at. It is a more complex app for the reason that it incorporates the Zoopla Zed index and a specific sold prices tab. It also has an additional search capability using augmented reality – something I’ve written about previously. It’s the first app to have a dedicated sold prices section and I can imagine agents might use this a bit to get comps on the go. 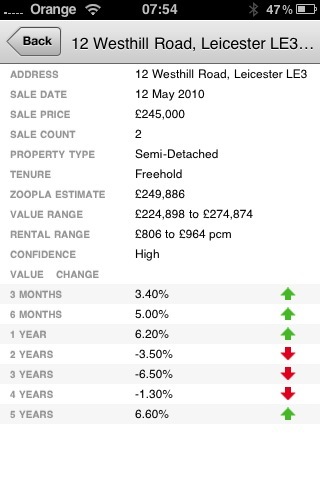 Rightmove show sold prices in amongst the results if you filter them in and findaproperty don’t yet include them. Rightmove are developing their use of sold price data so maybe we will see that included in their app at some point and findaproperty’s parent company the Daily Mail Group have just acquired mouseprice, which should improve the data they have available in this field but will probably be focused on their ‘insight’ product first. Augmented reality now exists in a number of applications and here is the first example of one of the major portals using it in their app. The truth is that it doesn’t actually make the property search more effective, but it will give Zoopla a marketing tool for increasing the exposure of their app, something that is much needed with them being the last of the ‘Big three’ to launch (Rightmove already have had approaching 1mil downloads). So if we start with the home page, I like the fact that when you open the app it automatically opens on the map view with pegs for properties nearby, in relation to your current location. You can also view these properties on a list, a hybrid map or through your camera (augmented reality). If you click on a property you are told the property type and price. Click the arrow and it takes you to the property listing. Also on the search results page is a link through to the Zed-index, which shows a basic value graph in that postcode area for the previous 5 years. You can further filter your search criteria and along the bottom of the screen are tabs to change to rental property, sold prices, Zed values (Estimated values based on the Zed index), sold prices and your stored favorites. From an agent’s perspective, as with the other major apps, there isn’t a click through to the agents web site but you can request details or call the agents directly from the app. 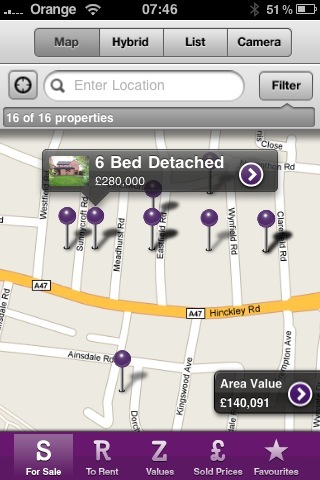 It also lacks a ‘find an agent’ button, which I think is a great function on the findaproperty app. All in all, this is a great app with some very clever functions that create a really rich experience. The quality of the photos doesn’t seem great to me, but that may not be in Zoopla’s hands. They have included some functions that are an improvement on the other two apps, but they are nearly a year behind Rightmove in launching, which I expect will hit their download numbers. Some of the functions Zoopla have included will always be unique to them and some will be in the pipeline for upgrades by the other portals. For now though, it is in my opinion the best UK property search app available. I have the Zoopla aspp on my Iphone – being a client of Zoopla I have to say its slightly disappointing. The way it uses google maps is not that great if two houses are for sale next door to each other it just chooses the first house to place a marker and you have to keep tapping on the marker to see anything else – would be handy if the marker simply stated ‘3’ if there were three houses under it for sale.